Yesterday, I drunk in a tavern(Izakaya) to celebrate success of an operation for my wife. This tavern(Izakaya) served various kinds of dishes to go with the drinks. 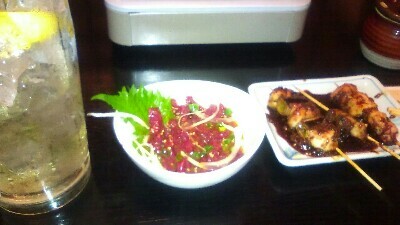 I ate raw horse meat and charcoal grilled chickens(Yakitori). The read meat of horse meat tastes like whale meat. Though I was not sober when I went to the tarvern, I remember their foods were really good. Congratulations on your wife's successful operation. I am so happy to hear that. It is a little relieved. Please take your time and relax. I was worried that the operation of my wife took longer than originally planned. However it makes good progress after the operation and she came back to normal life.